Research has made it clear: you don’t want workaholics running your business. It’s not uncommon for American employees to be working more than the standard 40 hours a week. In fact, according to 20-Something Finance, the U.S. is the most overworked developed nation in the world. They also stated that 85.8% of males and 66.5% of females work more than 40 hours of a week. It’s important to realize that working 55+ hours a week isn’t “overachieving,” it’s just plain unhealthy. A 2015 research article suggests that employees working a 55-hour week face a 33% increased risk of stroke than those working a 35 to 40-hour week. The side effects of long hours are more than just physical, too. Working crazy hours diminishes the opportunity for a healthy work-life balance, which can mentally drain employees. Overworked employees tend to have higher stress levels – and for a good reason. In most cases, the types of jobs that require longer hours and overtime are typically more stressful jobs by nature. Along with crazy hours, these employees might be expected to handle big projects on their own or deal with strict deadlines. Along with the stress from the work itself, overworked employees don’t get the benefits of a healthy work-life balance. More hours in the office mean less time spent with family and friends, as well any valuable alone time. These employees aren’t given the time they need to fully recharge and unwind from a stressful workweek. Instead, the stress will just continue to pile on. 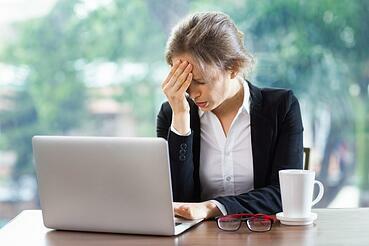 This increase in stress that overworked employees face can lead to a lot of health consequences. Stressed employees have a higher risk for depression, insomnia, weight gain, and high blood pressure. More hours in the office means more time spent sitting. Being confined to a small cubicle for most of the day leads to a sedentary lifestyle, which substantially increases the risk of many diseases. The sitting disease isn’t a new discovery. Years of research have shown that sitting too much is strongly linked to obesity, heart disease, and a shorter lifespan. Employers need to understand that a sedentary lifestyle isn’t just a personal problem. Adults that don’t achieve the recommended amount of physical activity per week can negatively impact a company through higher medical costs. A study by Florida Atlantic University found that sedentary lifestyles account for about $24 billion of direct medical spending in the U.S. per year. Long hours equate to less sleep. Employees are more likely to make mistakes when they’re tired. According to a Harvard Business Review article, only 1-3% of the population can sleep five or six hours a night without suffering some performance drop-off. Lack of sleep keeps the brain from functioning properly, causing troubles with memory, concentration, and attention span. While you might think that overworked employees are getting more tasks completed, you might want to think again. Productivity can take a nose-drive when employees are pushed past their limits. According to a 2016 article, overworked employees report more health problems, and as a direct consequence are less productive and use more sick days. Spending too much time at the office can easily lead to bad health habits. Employees who work long hours are more susceptible to things like unhealthy snacking, bad posture, and lack of exercise. When employees are swamped with assignments and spending an abnormal amount of time at work, they might find themselves too busy to pack a healthy lunch, too stressed to get a good night of sleep, and too crunched for time to fit in a morning workout. It’s extremely difficult for overworked employees to make time for themselves and their health. The bottom line is that overworking employees isn’t worth it. The productivity and health of your workforce will suffer tremendously. Employees need time away from the office to recharge for optimum work performance. So, start addressing work schedules that might be sabotaging your employees’ health. Check to see if your employees and company could benefit from hiring an assistant or lower-level employee to assist any overworked employees. Less overtime hours might be your ticket to healthier and happier employees. How do you encourage healthy hours at your company? Feel free to share in the comments below!